At the end of an eventful and successful year, we would like to thank all our members, friends and collaborators for their support and involvement in 2018. As a global network for food safety monitoring and quality assurance, MoniQA www.moniqa.org - first funded as an EU Network of Excellence and then established as an international association - has been active since 2007. We are happy to see that MoniQA is growing in numbers of involved network partners and collaborators, as well as in strength of impact with a number of new activities and plans for the years to come. We would like to wish you a blessed Christmas time and a successful start in the New Year! We are looking forward to working with you in 2019! ICC International conference – Grains for Wellbeing, 5-8 Nov 2018 in Taipei, Taiwan, R.O.C. We are pleased to announce that the registration and abstract submission is open for ICC International conference – Grains for Wellbeing, 5-8 Nov 2018 in Taipei, Taiwan, R.O.C. Grain is important in our diet, not only for providing energy and the feeling of joy from grain desserts, but also for improving health. Being staple food, refined grains such as rice and wheat have been highly industrialized; their quality and safety remain extremely important. However, grains may offer more. With health benefits, the precious functional components from grain such as beta-glucan, dietary fiber, antioxidants, etc., have enabled the introduction of innovative grain products. The conference will provide us a wonderful platform to discuss more about grains not only from agronomy to final products, but also from the quality to functionality. The products approach and its related science will be discussed in this conference of 10 sessions, such as Breeding and agronomy, Communication and regulatory, Bioactive components, Authenticity and Safety, Rice-based products, Wheat-based products, Speciality grains and pulses, Structure and functions, Health and Nutrition, Micronutrients and phytochemicals. The abstract submission for oral and poster presentation is open up to the end of June. A poster competition for students will be held in the conference as well. We sincerely invite you to share with us your research and outcome of work in this platform for a wonderful future of grain industry and human life, especially in the beautiful season in Formosa. Participation fee (lunch included): EUR 100,00 VAT excl. – EUR 121,00 VAT incl. One of the major problems in food safety and security regulation is that many existing laws, rules and guidelines are originated from decades-old data and methods, several of which are not even relevant to human exposure. The 1st GHI World Congress is to generate a platform to present and implement the most suitable assays for food safety and security assessment within different fields — from chemistry and microbiology, to genetic toxicology and genomics — throughout entire processes, from farm to fork. The outcomes of the Congress can pave the way toward more accurate detection of human risk to dietary components and thus, improve human health status. The intention is to produce a declaration that is agreed by all participants which calls for and establishes a target to change regulations within a specified time based on available knowledge. General abstract submission will be open from 1 September 2018 until 15 January 2019. The Scientific Committee welcomes submission for oral and poster presentations. For more information and registration please follow the link. Every year EFFoST organizes this prestigious international food science and technology conference, an important scientific event that brings together world-renowned researchers, scientists, policy makers, professionals and students from multidisciplinary food-related fields to share the latest developments, meet old friends and form new partnerships. See here for details of our previous conferences. The 32nd EFFoST International Conference will be held in Nantes, France from 6-8 November 2018 under the theme: Developing innovative food structures and functionalities through process and reformulation to satisfy consumer needs and expectations. Oral and paper abstracts are now invited on the following topics. They should be submitted using the online abstract submission system. When foods are pushed by objectives such as the clean label trend, vegan foods, ‘free from’ foods (gluten, lactose etc. ), reduction of salt, sugar, lipids, and therefore when reformulation means less ingredients, food processing appears very often as the ultimate means to keep food safe, good and with adapted shelf life. In addition, consumers and industry expect sustainable solutions with reduced environmental footprint. All steps of food production are important: ingredients sourcing, assembly and process of transformation, packaging, cold chain etc. The industry is stretched between new sourcing, which is sometimes unsustainable and local sourcing, which has limitations. Minimal processing to keep the nutrition values of raw ingredients is often expected by consumers but again has limitations. Lastly, education and communication are of ultimate importance to achieve a trustable link between consumers and industry; this encompasses the development of the factory of tomorrow that must be as transparent as possible to the public. At the 32nd EFFoST International Conference food scientists and food industry experts will gather to debate and discuss the recent trends in food science and food processing. The conference will also focus on re-establishing trust and mutual understanding between “industry” and “consumers” for the benefit of both parties and for the benefit of the health and wellbeing of the European consumers. Check out the final programme at https://moniqa-vienna2018.meetinghand.com/en/491-programme. Online registration and regular registration fees end 31 May 2018. Food fraud undermines consumer confidence and threatens food safety. According to the 2016 US Pharmacopeial Convention, economically motivated adulteration (EMA) is a global economic problem and a public health issue. It is estimated to cost the industry $ 10-15 billion annually and up to 10% of the global food supply appear to be affected. Food fraud typically involves a wide range of intentional fraudulent activities, usually for economic reasons (addition of non-authentic substances or removal or replacement of authentic substances) or counterfeiting (production of substandard goods sold as premium brands). An exciting programme with practical litigation cases, with strategies and methods for detecting and combating food fraud, are presented by renowned speakers from around the world. Join us in Vienna and meet the "Food Detectives" and get to know modern technologies that are looking for the "unknown" or learn about legal regulations and get practical advice for protecting your branded products, for correct food labeling food, and ultimately to maintain consumer trust. The symposium includes speakers from the United Nation's FAO/IAEA, IFS, LGC, USP, as well as industry representatives from Nestle, SQTS/MIGROS, and others, as well as from various law firms and food research institutions. The Second International MoniQA Symposium on Food Fraud Prevention and Effective Food Allergen Management will address food authenticity, food fraud and the need for simple labeling as major drivers for both the food industry and companies involved in rapidly developing new analytical technologies. The symposium will provide ample space and time for poster viewing and discussion, as well as publication of the abstract, and including the abstract/poster in a best poster award competition. The ISEKI-Food Association (European Association for Integrating Food Science and Engineering Knowledge Into the Food Chain) and the University of Hohenheim are organising the 5th International ISEKI_Food Conference (ISEKI_Food 2018) to be held in Stuttgart, University of Hohenheim, Germany, 3 - 5 July 2018. This 5th edition has as its driving topic “The Food System Approach – New Challenges for Education, Research and Industry“. A modern approach to face the societal, climate and nutritional challenges, impairing food security and the global sustainability of the food chain, has to consider all activities related to food production, processing, packaging, distribution, preparation and consumption. Several poster awards are waiting for you as well as some very interesting workshops to attend like the PhD workshop, the Food Waste Recovery Workshop and some free workshops. Submit your abstracts and meet the ISEKI-network in Stuttgart! The unit will next run in June/July/August 2018 including a residential week of face-to-face teaching in Manchester from the 9th-13th July 2018. The course is run at the Manchester Institute of Biotechnology with elements also hosted by Waters Corporation (Wilmslow). The course is led by Professor Clare Mills, a biochemist with research interests in food allergy and expertise in risk assessment and analysis including bioanalysis and mass spectrometry and who led the IFAAM and EuroPrevall EU projects on food allergy and is a member of UK ACNFP and EFSA GMO panel self-task allergenicity working group. The deputy lead for the course is René Crevel, HonorarySenior Lecturer who is responsible for advice and guidance on food allergy, risk assessment and management, exChair, Food Allergy Task Force, ILSI-Europe and is a member of the UK's Committee on Toxicity of Chemicals in Food, Consumer Products and the Environment. The course gives an overview of IgE and non IgE-mediated adverse reactions to foods, the protein molecules that cause such reactions and the impact that food processing and the food matrix has on their structure and properties and how to undertake allergen risk assessment. You will also learn about the way in which complementary allergen analytical methods, including DNA-based, immune-based and mass spectrometry methods, can be used to inform the risk assessment process. Students completing this short-course will be given a certificate of completion. Those continuing with a further five weeks of online teaching and successfully completing the assessment will be awarded 15 credits. You will learn through a combination of online and a week of face-to-face teaching (including practicals) and will gain an overview of IgE and non IgE-mediated adverse reactions to foods, the protein molecules that cause such reactions and the impact that food processing and the food matrix has on their structure and properties. For the credit bearing option please register at: https://www.bmh.manchester.ac.uk/study/cpd/courses/food-allergen-analysis-and-management-cpd-unit/). The organisers of the Second MoniQA Symposium on Food Fraud Prevention and Effective Food Allergen Management, Vienna, Austria 7-8 June 2018, would like to invite you to submit an abstract for poster presentation here. Register now! Food Fraud Prevention and Effective Food Allergen Management, Vienna, Austria, 7-8 June 2018! 27-28 February 2018 our new MoniQA member USP offers a workshop in Rockville, MD, USA. Adulteration and fraud in food ingredients and dietary supplements are major concerns for industry, consumers, and regulatory authorities. USP’s workshop brings together internationally recognized experts to discuss the current state of technologies for detecting economically motivated adulteration and minimizing supply chain risk. Speakers from Walmart, PepsiCo, the European Commission, as well as technical experts from the University of Guelph, FOCOS, and Fonterra will be included. An optional olive oil tasting session will be held at the conclusion of the workshop. After the great success and extremely positive response after the 1st MoniQA Symposium on Food Fraud Prevention and Effective Food Allergen Management in Bari, Italy, 26-27 January 2017, we would like to invite you to mark your calendars for the 2nd MoniQA Symposium scheduled for 7-8 June 2018, in Vienna, Austria. Food authenticity, food fraud and the need for simple labeling are major drivers for both the food industry and companies involved in rapidly developing new analytical technologies. The food industry must adapt to this changing landscape and be aware of the regulatory and legal issues that drive the change in the safety and quality of food. This workshop will bring together food industry experts, regulators, academics and nongovernmental organizations (NGOs) to discuss the latest information on the legal and other issues in the food space. o Litigation: class action vs consumer deception"
Two topics that rarely share one event, but indeed food authenticity and food allergen management have a lot in common: both require appropriate labelling of foods, both are not always apparent to the consumer, both concern consumer trust, both need to be managed by the food industry, both may have strong impacts on the health and socio-economics of a society, both need adequate communication, both use comprehensive databases, both need sophisticated analytical methods, both require a collaborative effort from science, industry and the regulatory environment. Last year’s programme, speakers, exhibitors and sponsors can be viewed at http://bari2017.moniqa.org/. Please mind that the symposium 2018 website will be up soon. In its latest session of the AOAC International Stakeholder Panel on Alternative Methods (ISPAM) MoniQA’s first allergen reference material validated for use in milk allergen detection methods was included in AOAC’s SMPR (Standard Method Performance Requirements) for the “Quantitation of Milk by ELISA-based Methods”. AOAC SMPRs describe the minimum recommended performance characteristics to be used during the evaluation of a method. The evaluation may be an on-site verification, a single-laboratory validation, or a multi-site collaborative study. SMPRs are written and adopted by AOAC Stakeholder Panels composed of representatives from the industry, regulatory organizations, contract laboratories, test kit manufacturers, and academic institutions. AOAC SMPRs are used by AOAC Expert Review Panels in their evaluation of validation study data for method being considered for Performance Tested Methods or AOAC Official Methods of Analysis, and can be used as acceptance criteria for verification at user laboratories. At the occasion of the Whole Grain Summit in Vienna MoniQA’s Gluten-Free Working Group, a subgroup of MoniQA’s Task Force on Food Allergen Reference Materials, met in Vienna to discuss the characterization and production of a new commodity Reference Material to complement the PWG gliadin standard. During the past 3 years TUM - the Technical University of Munich (Germany), BME - Budapest University of Economics (Hungary, BOKU - University of Life Sciences and Natural Resources Vienna (Austria, and HealthCanada (Canada) under the auspices of MoniQA Association have been working on the characterization of some 50 wheat flours to select most representatives wheat varieties to produce a reference material for gluten free analysis. If you are interested to sign up for this group or contribute as MoniQA Member, please contact moniqa [at] moniqa [dot] org. Members of the Task Force and MoniQA Members can access a full report and presentation of the meeting. Hacettepe University: Following an invitation by Hacettepe University www.food.hacettepe.edu.tr based in Ankara, Roland Poms had the chance to visit various companies and the university in Ankara. Hacettepe University was one of the original partners in the EU FP6 funded MoniQA Network of Excellence and it still maintains an active role in MoniQA's food safety educational, training and research activities. With Prof. Hamit Köksel and Prof. Ismail Boyaci MoniQA is proud to have two leading scientists as main contacts in Turkey. Biasis Ltd: It was a pleasure to visit Biasis Ltd, a spin off company from Hacettepe University, and to meet with the whole team to discuss research collaborations and mobilisation of third party funding for the various innovations that are developed and tested in the main company building. Biasis Ltd was founded in 2005 at Hacettepe University Technopolis. Research studies in Biasis are mainly focused on rapid food analysis which are based on spectroscopic methods (LIBS, Raman, NIR and Fluorescence spectroscopy). The company has developed rapid spectroscopic solutions for measurements of wheat, milk, meat and egg samples. Biasis develops their own spectroscopic instruments for food analysis and offers several services, such as R&D consultancy, food analysis and 3D modeling services. BASTAK: Roland Poms met with Zeki Demirtasoglu, General Manager and Owner of BASTAK Company www.bastak.com.tr/eng/, and Suzan Kucuk, International Sales Manager, to discuss method development, validation and international cooperation. BASTAK develops, produces and sells analytical appliances, mainly for cereal and flour analysis, but also other applications and services. MEETINGHAND: A meeting with Dr. Esat Arber, Founder of Meetinghand www.meetinghand.com, was focused on a training on the use of a newly developed conference management tool to allow MoniQA a more efficient event management and optimized monitoring of registrations, fee payments and post event follow up. MoniQA will evaluate the use of meetinghand software in its 2018 events. Roland Poms, Secretary General of MoniQA Association was invited by the Ankara based Turkish Chamber of Food Engineers to give a talk on Food Authenticity and Food Fraud Prevention - Recent misleading claims related to food and nutrition at the 10th Gida Mühendisligi Kongresi (10th Food Technology Congress) in Antalya, Turkey. Some 400 food technologists and food scientists from industry and academia participated in this biannual event. It was a special privilege for Roland Poms and MoniQA to be the only invited foreign guest. The meeting gave great opportunity to network with Turkish scientists and food producers, as well as to meet with new and old friends of MoniQA. This workshop will be held in Italian and partly in English and will offer the participants an update on innovative food allergen management by international experts and up-to-date information on new risk assessment data and understand its implication for consumers, industry and testing laboratories. Furthermore, it will give answers to questions such as:What are new tools for allergy and allergen management? What are the new validated reference materials? How can you trust and read the laboratory test results? What are the new analytical techniques? Starting in September 2016, the OLEUM project will develop new and improved existing analytical methods for detecting fraud and ensuring quality of olive oil. The project will address the four main gaps in the current knowledge: legislation and regulation, analysis, harmonisation and coordination, consumer and market confidence. During the 2 day meeting all work packages presented updates of their activities. The partners also discussed specific issues related to sampling and analytical activities, validation of the analytical methods and reference standards, and progress towards the establishment of the OLEUM Network. Stay tuned for more updates in the near future and various upcoming presentations at conferences and workshops. Roland Poms from MoniQA gave an update on the characterization activities for the wheat/gluten material and the soy material. Both materials will be prepared as commodity materials and incurred in a cookie material at a Low and High concentration at relevant analytical levels. The total egg and egg white materials will follow the lead of the milk materials and will also become available in similar protein standard concentrations. It was well accepted that the materials are validated in mg/kg protein and that results obtained with any analytical method shall be encouraged to express their results in mg/kg commodity protein also, which will help to facilitate communication between analysts, risk assessors, and regulatory bodies. Following the end of iFAAM – the EU funded collaborative research project on “Integrated Approaches to Food Allergy and Food Allergen Management”, ILSI Europe is organizing a symposium 18-20 April 2018, in Madrid, Spain. This symposium will provide an ideal forum to disseminate the evidence, knowledge and tools developed in the iFAAM project to stakeholders and actors involved in food allergen and food allergy management globally. The symposium will also identify key activities required for further implementation. Save the date and be part of this forum to address current and future challenges in food allergy and food allergen management. The MoniQA Association is consortium partner of iFAAM and supports the international efforts to make precautionary food allergen labeling more transparent for consumers and to provide a sustainable online toolbox for allergen management along the food supply chain. The task force will meet on the last day of the conference at 2pm – 5pm. Please find below the preliminary agenda. Dates: The next start date for this course is September 2018. The MoniQA Supervisory Board 2017 and the co-opted Advisory Panel 2017 met in Rome, Italy, 27 June 2017. This meeting was intended to draft some strategic plans for priority technical topics, contents for future workshops and symposia, and other activities. Some items on the agenda deal with food allergen reference materials, the completion of the iFAAM project and possible implications, new projects on the horizon, more specific activities in the area of food fraud prevention, the use and validation of untargeted methods, as well as future workshops and symposia. Web address, email addresses and telephone number are not affected by this change of address. The ICC Asia-Pacific Grains Conference (APGC) which was co-organised by ICC - The International Association for Cereal Science and Technology and CCOA - The Chinese Cereals and Oils Association (both MoniQA Founder Members), took place in Xiamen, China, 21-24 May 2017. On the theme "Science and Innovations in Grains: From Asia-Pacific to the World", the 1st APGC brought together some 400 participants. The conference promoted scientific and technological knowledge and innovations related to the processing, utilisation, green storage, quality and safety, health and nutrition, and consumer needs of grains, oil seeds, pulses, and foods to help shape their future in the Asia-Pacific region. The conference aimed at attracting researchers, product developers, industry representatives, legislators, and stakeholders from around the world, but especially from the Asia-Pacific region. A large exhibition of products, machinery and instruments complemented the technical programme and gave the participants a comprehensive overview of the state of the art in the field of grains, oils, and foods. Roland Poms from MoniQA gave a talk on Food Authenticity and Food Fraud Prevention utilizing highly sophisticated methods of analysis. MoniQA, together with BOKU Vienna, TUM Munich and BME Budapest also presented a poster on the characterization of wheat varieties for a new gluten reference material. To check the final programme please click here. Roland Poms, Secretary General of MoniQA, was invited to give a talk on Food Allergen Management at an International Conference entitled “Food Safety and Risk Analysis” which was held in Sochi, Russia, 18-19 May 2017. The Food and Agriculture Organization of the United Nations (FAO) and Rospotrebnadzor, the Russian Federal Agency for Wellbeing, Consumer Rights and Consumer Protection were jointly organizing this meeting. The conference drew an international audience and discussed global and regional food safety challenges. This international meeting brought together more than 350 delegates representing sectoral governmental agencies, specialized international organizations, the private sector, consumers’ associations and the scientific community. The conference was aimed at exchanging experiences and best practices on assessing multifaceted food safety risks, enhancing multilateral dialogue in the field of improved nutrition, expanding international and interregional sectoral cooperation, and promoting partnerships between different stakeholders. Please check the conference programme here. Globalization and international trade have drastically changed the way that food is produced, processed, transported and consumed. This has created the need for a more holistic and integrated approach to assuring the safety of the food chain. Additional pressures come from climate change, food security concerns, economic volatility and unknown risks related to changing agricultural practices or new production technologies. Modern approaches in risk assessment and risk management are needed to ensure public health. Harmonization of food safety standards and international collaboration are necessary to mitigate emerging and persistent food safety risks. Many legislations use a risk analysis framework fostered by the World Health Organization (WHO), to ensure that regulatory decisions about foods are science-based and transparent. In recent years, many countries established distinct separate entities for risk assessment (science based) and risk management (policy based). Regional, national and trans-national food safety and consumer protection strategies may differ in focus and priorities due to traditional consumption patterns, geographic and climatic situations, and socio-economic considerations. Basis for this conference are the 2030 Agenda for Sustainable Development adopted in September 2015, which sets goals to eradicate hunger, ensure access to safe and nutritious food, end all forms of malnutrition, combat communicable and non-communicable diseases. The achievement of these goals directly depends on ensuring food safety. As confirmed by the Second International FAO/WHO Conference on Nutrition (ICN2), improvements in diet and nutrition quality require relevant normative frameworks and control systems for food safety regulation. Increasing global Antimicrobial Resistance (AMR) is a major threat to human and animal health. It endangers modern human and veterinary medicine and undermines the safety of our food and environment. Antimicrobials play a critical role in the treatment of diseases of farm animals (aquatic and terrestrial) and plants. Their use is essential to food security, to human well-being, and to animal welfare. However, the misuse of these drugs, associated with the emergence and spread of antimicrobial-resistant micro-organisms, places everyone at risk (FAO, 2016). Declared goals of the jointly organized conference were 1) strengthening multilateral international cooperation on food safety, 2) improving nutrition on a global and regional level, 3) realizing the provisions of the 2030 Agenda and the ICN2 recommendations, and 4) a Political Declaration of the High-Level Meeting of the UN General Assembly on antimicrobial resistance. On behalf of the conference organizers. The first validated Reference Materials for Food Allergen Analysis are now available and can be ordered from MoniQA Association. The first set of materials includes testing materials for milk allergen analysis comprising a Positive Control (SMP-MQA 092014, characterized dried skim milk powder, validated protein content), Negative Control (BLANK-MQA 082015, based on a gluten free cookie), and 2 Incurred Materials: LOW-MQA 102016 (SMP incurred in gluten free cookies, milled, concentration approx. 3.54 mg/kg milk protein, validated) and HIGH-MQA 082016 (SMP incurred in gluten free cookies, milled, concentration approx. 17.7 mg/kg milk protein, validated). The materials were produced by Trilogy Laboratories USA (MoniQA Member since 2013) and have been commercially available starting 01 January 2017 through MoniQA Association. All materials come with a data sheet and a reference certificate to the analytical results, a measurement uncertainty and validation information. Distribution and shipment of the materials is subcontracted to Authorized Distributors among the MoniQA Member Institutions. Order the materials by using the online order form and return the completed, signed/stamped form to moniqa [at] moniqa [dot] org. The materials come in 5 g pouches (air tight sealed) and sold for 220.- Euro per pouch or 792.- € for the set of all 4 materials. 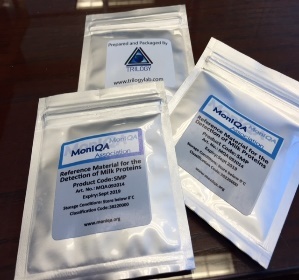 The Reference Materials for Food Allergen Analysis can be ordered from MoniQA Association. MoniQA Members may also qualify as Authorized Distributor of these reference materials and receive a distributor/re-seller discount (170.- € per pouch or 612.- € for the set of all 4 materials). If your company/organization is interested to become an authorized distributor, please contact roland [dot] poms [at] moniqa [dot] org. Draft sales agreement templates have been drafted and are currently reviewed. Further reference materials are in preparation (gluten, egg, soy) and will become available shortly. Why food allergen reference materials? Effective food allergen risk assessment and food allergen management are important to protect allergic consumers and to comply with allergen labelling regulations. Such approaches require reliable analytical tools for the detection of allergens in food. Due to the nature of the analytes and their susceptibility to various processing effects, reliability and comparability of results have posed a great challenge. Both reference methods and reference materials are urgently needed to assure the quality, reliability and comparability of analytical results obtained with different methods. Being an important component of this analytical quality assurance, reference materials contribute to reliable and accurate results. Ensuring the correctness of analytical results is crucial to laboratories, since incorrect results may trigger decisions that can cause economic damage or pose a risk to public health. is critical for accuracy and comparability of analysis results. Reference materials must be sufficiently homogenous, stable and traceable. Usually extensive material characterisation and testing for homogeneity and stability of the material precede the availability of reference materials. Ideally a certified reference material (CRM) shall be used, which has been validated by accredited institutions and is subject to strict quality testing. Certified reference materials usually come with a certificate with information on the methods used for validation/assigning a value, the measurement uncertainty and traceability of the numerical value of the analyte’s concentration in the material or the analyte’s purity. According to ISO/IEC 17025, accredited laboratories are required to use certified reference material. At this point the currently available knowledge base and methodological abilities do not allow to certify food allergen reference materials according to international standards requirements, however, for the currently available internationally validated materials the international task force led by MoniQA Association is discussing appropriate procedures for the certification of the offered food allergen reference materials according to ISO Standards. Some 35 participants were involved in a workshop on "Introduction to food allergen management" that was held on 7 February 2017 in Rome, Italy. This workshop was organised by Hylobates (Member of MoniQA since 2016) within the framework of the EU-funded Project iFAAM (Integrated Approaches to Food Allergen and Allergy Risk Management). The workshop provided an introduction on food allergen management and included two parts: a theoretical part with presentations and discussions given by Luca Bucchini and Roland Poms, and a practical part with hands-on training given by Dario Deli & Serena Leardini from Romer Labs, and Francesco Fieramosca & Valeria Bassani from Tecna. Due to the high interest of the participants a follow-up workshop is planned in Italy sometime in June. Stay posted! A more comprehensive report on the workshop is available here. Close to 100 participants followed an exciting scientific and at the same time very practical and informative symposium #MoniqaBari on food fraud prevention and effective food allergen management in Bari, Italy, 26-27 January 2017, bari2017.moniqa.org. Due to the extremely positive feedback, we are considering to take the program on the road. Two topics that rarely share one event, but indeed food authenticity and food allergen management have a lot in common: both require appropriate labelling of foods, both are not always apparent to the consumer, both concern consumer trust, both need to be managed by the food industry, both may have strong impacts on the health and socio-economics of a society, both need adequate communication, both use comprehensive databases, both need sophisticated analytical methods, both require a collaborative effort from science, industry and the regulatory environment. The symposium brought together participants from the food industry, ingredient suppliers, agricultural producers, retail and trade, consumer organizations, private and public analytical laboratories, representatives from R&D, marketing, quality control, legal departments, as well as food scientists, technologists, analytical method providers, regulatory bodies, authorities and the media. You may want to read the full report by Michael Walker, LGC, UK at http://www.moniqa.org/webfm_send/261. The conference chairs, Roland Poms from MoniQA Association (Austria) and Linda Monaci from ISPA-CNR (Italy) would like to thank all speakers, poster presenters, exhibitors and sponsors for their support in making this event a great success! Within the framework of the EU-funded Project iFAAM (Integrated Approaches to Food Allergen and Allergy Risk Management), we would like to invite you to a workshop on "Introduction to food allergen management" on 7 February 2017 in Rome. Short user-friendly lectures, demonstrations, and interactive Q&A sessions will give attendees a basic knowledge and understanding of food allergen management. The workshop will be mainly held in Italian. Please note that the number of participants is limited and registration will be on a first-come, first served basis. The registration is free of charge and will be confirmed after receipt of the registration form included in the workshop leaflet. The first validated Reference Materials for Food Allergen Analysis have been presented at the latest AOAC Annual Meeting 2016 in Dallas, Texas, USA. The first set of materials includes testing materials for milk allergen analysis comprising a Positive Control (SMP-MQA 092014, characterized dried skim milk powder), Negative Control (BLANK-MQA 082015, based on a gluten free cookie), and 2 Incurred Materials: LOW-MQA 102016 (SMP incurred in gluten free cookies, milled, concentration approx. 5 ppm) and HIGH-MQA 082016 (SMP incurred in gluten free cookies, milled, concentration approx. 50 ppm). The materials were produced by Trilogy Laboratories USA (MoniQA Member since 2013) and will be commercially available starting 01 January 2017 through MoniQA Association. Shipments will be coordinated by R-Biopharm Germany (MoniQA Member since 2011). The materials will come in 5 g pouches (air tight sealed) and sold for 220.- Euro per pouch or 792.- € for the set of all 4 materials. MoniQA Members may also qualify as Authorized Distributor of these reference materials and receive a distributor/re-seller discount (170.- € per pouch or 612.- € for the set of all 4 materials). Dr. Walter Mayrhofer, Erich Trummer – Mayor of Neutal, Verena Dunst and Dr. Roland Poms. Dr. Walter Mayrhofer from the FTI Burgenland (Research-Technology-Innovation Agency) (http://www.fti-burgenland.at/de/) opened the kick-off event on behalf of MoniQA’s new offices in Neutal, Austria (some 50 minutes’ drive South of Vienna Airport) with an appreciation of MoniQA’s initiatives in supporting the food industry and authorities to guarantee a high degree of food safety and quality, and by bringing new international expertise to Burgenland. Several members of MoniQA presented their institution joint activities at the event: Prof. Wolfgang Kneifel from BOKU – the University of Natural Resources and Life Sciences Vienna https://www.boku.ac.at/en/ explained the joint international educational and training programmes; BSc. Christoph Reiterich from R-Biopharm http://www.r-biopharm.com/ (a biotech company in food diagnostics, Germany) reported on the joint initiative to produce new reference materials for food allergen analysis and the validation of test kits. Finally, Dr. Rita Litauszky from FFG – the Austrian Research Promotion Agency https://www.ffg.at/en appreciated MoniQA’s track of successful research proposals funded by the European Commission. A short television spot (ORF) and a Press Release of this event (both in German) can be accessed on MoniQA’s homepage www.moniqa.org. Symposium on "Food Fraud Prevention and Effective Food Allergen Management"
MoniQA Association is organizing a two-day-symposium on Food Fraud Prevention and Effective Food Allergen Management targeted toward the food industry/food manufacturers, food production auditors and representatives from the regulatory environment. This workshop will be especially suitable for SMEs (small and medium sized enterprises) and fulfilling CPD (Continuous Professional Development) requirements. The workshop will give practical, scientific and legal background information, insight in innovative approaches, newly developed tools and recently introduced analytical methods to combat food fraud and improve food allergen management. These new developments will be linked to real case studies and learnings from recent incidents. Learnings from stakeholder viewpoints, such as food manufacturers, food laboratories, food analytical methods providers, auditors, risk assessors, lawyers, trainers/teachers, media and communicators, regulatory bodies and policy makers shall complement the scientific programme and stimulate open discussion. Since January 2015, MoniQA (International Association for Monitoring and Quality Assurance in the Total Food Supply Chain) maintains its offices in the Technologiezentrum Neutal, Austria (some 50 minutes drive south from Vienna Airport). The FTI Burgenland (Research-Technology-Innovation Agency) is inviting to a kick-off event held for the MoniQA Association. At the event you have the opportunity to learn more about MoniQA’s global network of experts from the fields of science, research, industry and regulatory bodies. The primary goal of the organisation is the facilitation of close collaborations and the resourcing of “tools” for granting food and nutrition safety. There are also offers for consulting services and education opportunities as well as organising conventions and workshops. The FTI Burgenland is a member in MoniQA Association and represents on behalf of all food industry companies in the Burgenland area. At the event you will be able to hear more about MoniQA, its available services and you can learn first-hand through a personal talk how you could utilise the association’s offerings for your company and products. Take this opportunity to meet and learn more also about other food industry companies in Burgenland. Participation is free of charge but we would kindly ask you to confirm your attendance at office [at] fti-burgenland [dot] at by 23rd September 2016. Precautionary (allergen) labelling: What is done in practice? iFAAM, as an EU funded research project (2013-2017) aims at providing various tools and guidelines for an improved allergen and allergy management. In order to understand industry, retail, and supplier attitudes to the use of reference doses to determine risk thresholds for precautionary (allergen) labelling, we would like to assess food industry’s use of, and attitudes to strategies such as the Voluntary Incidental Trace Allergen Labelling (VITAL) which contains the "may be present" statement, and possible alternatives. MoniQA would like to invite you to take part in a survey, which is hosted by our partner organization EuroFIR AISBL. Responses in the survey are anonymous. Any information they provide will be treated with strict confidence. We are hopeful that outcomes of this research will enable those involved in the development of reference doses and precautionary labelling (i.e. manufacturers and food scientists) to identify critical barriers to acceptance by industry, so that these may be addressed, and the most effective methods used to encourage consumer understanding, acceptability and uptake. The materials are a result of an initiative that met in 2013 in Washington, MO, USA, which progressed into a MoniQA Task Force on the development of reference materials for food allergen and gluten-free analysis. The Task Force is an international group comprised of several SDOs (Standardisation Organisations), industry representatives, policy makers, test kit providers and method developers, analytical companies, as well as representatives from various universities. This international group has been working towards consensus on the specific requirements and the design of globally acceptable reference/testing materials for allergen and gluten-free analysis. For this purpose MoniQA has liaised with the EU funded project iFAAM, the Prolamin Working Group, Health Canada, FARRP, Australia’s Allergen Bureau (Vital), and others. • Explaining how the integrated risk assessment approach can help to define benchmarks for precautionary allergen labelling and make labels more transparent for all stakeholders. MoniQA participated in three different calls for proposals with deadline February 2016 in the frame of the European Commission’s Horizon2020 Programme. Two of these submissions were evaluated positively by the EC and these two successful consortia were invited to submit a full proposal at stage two with a deadline in September 2016. Interested members of MoniQA Association may still get involved in these proposals as Third Party to MoniQA, if needed expertise can be filled by your organisation. If you are interested to get involved in MoniQA and/or any of the calls for research proposals below, please contact moniqa [at] moniqa [dot] org. 1) SFS-37-2016: The impact of consumer practices in food safety: risks and mitigation strategies, successful through stage 1. MoniQA is Workpackage Leader, a full proposal will be submitted by 13 September 2016. 2) SFS-33-2016: Understanding food value chain and network dynamics, successful through stage 1. MoniQA is Task Leader, a full proposal will be submitted by 13 September 2016. The aims of this workshop is to explore the requirements for a health claim on products including the human dietary studies likely to be necessary to generate the evidence required for positive opinion from EFSA. If delegates are unable to complete their travel on the same day as the meeting, RICHFIELDS will provide one night’s accommodation at the Penta or another suitable local hotel. Furthermore Roland Poms, Austria, was confirmed as Secretary General 2016-2018. This year the ISEKI-Food Association (IFA) organises the 4th International ISEKI-Food Conference in Vienna, 6-8 July 2016 at the University of Natural Life Sciences (BOKU) (http://www.isekiconferences.com/vienna2016/), where we expect again 200-300 participants. For the best contributions several sponsored awards will be available. A special session “Technologists meet Nutritionists” will be focusing on “Healthgrain”. MoniQA will contribute to this conference with several presentations and plans to organize a Task Force Meeting at the conference location. Renew your MoniQA Membership 2016 or sign-up as new member now! 3. Easy access and involvement in international research proposals and projects funded by the EU, UNO, Bill Gates Foundation, governments, etc…. 15. 10% Discount on individual subscriptions of WMJ – World Mycotoxin Journal - online (see http://www.wageningenacademic.com/loi/wmj). Join one of various interesting MoniQA activities now! Please feel free to join any of MoniQA’s current activities. The invitation is open to all MoniQA Members and to those who are planning to sign-up in the near future. MoniQA is an international and interdisciplinary network of professionals from institutions working in food research, regulatory bodies and trade, providing solutions to promote a safer and secure food supply worldwide. MoniQA facilitates international research collaborations to enable services and products for food safety & quality assurance. MoniQA contributes to the development and validation of analytical methods, provides training and continuous professional development (CPD), consultancy and socio-economic impact assessment. 1) Preparation and exploring research proposals for EU’s Horizon2020 Funding Programme. Examples of past and current project involvements of MoniQA are MoniQA NoE (FP6), PlantLibra (FP7), Connect4Action (FP7), iFAAM (FP7), and others. Currently MoniQA is facilitating project participation for members in Horizon 2020 calls for 2016. 3) Join MoniQA’s task force on method validation: Preparation of guidelines and protocols for validation of screening methods, validation of binary methods, validation of mass spectroscopic methods, current focus on mycotoxins, allergens, and authenticity issues. MoniQA contributed in the past to AOAC guidelines and EU directives. 4) Join MoniQA’s task force on Food Allergen Reference Materials: Preparation, design and production of allergen and gluten-free reference materials for milk, egg, peanut, hazelnut, wheat, barley, rye, oats, a.o. MoniQA’s first allergen reference materials (dry skim milk and a gluten free matrix material) are currently being tested by an international ring trial. We would like to congratulate the awardees of the 5th MoniQA International Conference 2015! Selected by an international jury (Sean Astley, UK; Richard Cantrill, USA; Paul Finglas, UK; Olaf Nehlich, AT; Karin Zimmermann, NL; and Marija Zunabovic-Pichler, AT) the best abstract, best poster and best research work were premiered at the latest MoniQA Conference in Porto, Portugal, 16-18 September 2015. The Highest Impact Award was received by Telmo Fernandes from REQUIMTE-LAQV, Portugal, www.requimte.pt/laqv/, on behalf of all co-authors for his work on “Evaluating the performance of a novel single-tube nested real-time PCR on the detection of walnut allergens in cakes as affected by thermal processing”. 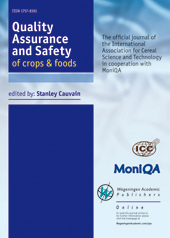 The Highest Impact Award in the value of € 1,800.- is an Open Access publication of this or a related research work in QAS – Quality Assurance and Safety of Foods & Crops. This award was sponsored by the publisher of QAS, Wageningen Academic Publishing, the Netherlands, www.wageningenacademic.com. The Best Poster Award was received by Ricardo Assuncao from INSA - Instituto Nacional de Saúde Dr. Ricardo Jorge, Portugal, www.insa.pt, on behalf of all co-authors for his work on “Risk assessment of Portuguese children dietary exposure to co-occurring mycotoxins in processed cereal-based foods”. This award was sponsored by R-Biopharm www.r-biopharm.com (MoniQA Member since 2012) with a 300.- € cash award. The Best Abstract Award was received by Joana Costa from REQUIMTE-LAQV, Portugal, www.requimte.pt/laqv/, on behalf of all co-authors for her work on “Exploiting bioinformatics tools to assess CP4-EPSPS peptides as potential biomarkers of genetically modified soybeans”. This award was sponsored by MoniQA Association www.moniqa.org with a 300.- € cash award. Meet the keynote speakers of the 5th MoniQA International Conference "Food and Health - Risks and Benefits"
The conference programme of the the 5th MoniQA International Conference "Food and Health - Risks and Benefits" will become available soon. Poster abstracts will still be accepted until 15 July 2015. Registration: porto2015.moniqa.org/register. Early Bird Registration ends on 15 July 2015 (received fee)! Abstract submission for posters: porto2015.moniqa.org/abstract_submission ends on 15 July 2015! MoniQA proudly presents its newest membership category: Micro-companies can enjoy the full suite of benefits of a regular membership in MoniQA at half price. Starting in 2015 legal persons/consultants/one-man companies and small companies (SMEs) with less than 6 employees and a turn over less than 400,000.- € per year may qualify for a 50 % discounted membership fee in MoniQA. For 500.- € per year micro-companies can enjoy immediate benefits within MoniQA's Global Food Safety and Quality Network including the services listed below. Additionally, micro-companies may enjoy a new offer (coming soon!) to sign up for a joint membership in MoniQA www.moniqa.org and EuroFIR www.eurofir.org for a further discounted price. For only 800.- € per year micro-companies will get high value services offered by both associations at a low price and covering food data and information underpinning nutrition and public health aspects. Sign up for Membership in MoniQA or jointly in MoniQA/EuroFir today and start benefiting from the associations' international network and a variety of activities and services (details can be found on www.moniqa.org/about/association and www.eurofir.org/?page_id=255). Preparation, design and production of allergen and gluten-free reference materials for milk, egg, peanut, hazelnut, wheat, barley, rye, oats, a.o. If you want to make use of any of the sponsoring or contribution opportunities at these meetings, please contact MoniQA Secretariat at moniqa [at] moniqa [dot] org. After 6 consultations MoniQA's international task force on Food Allergen Reference Materials will meet again in Porto, Portugal, in the morning of 16 September 2015 ahead of the 5th MoniQA International Conference. Registration for this meeting is required by sending an email to conference [at] moniqa [dot] org; it is free for MoniQA Members and the initial task force members. Current status: After extensive characterization the first materials (milk, a blank matrix material "rice cookie") are about to being tested and validated by the international community. For the gluten-free materials some 35 wheat varieties/flours have been extensively characterized and are now ready for final selection. Additional materials such as whole egg, peanut, hazelnut, and soy are in preparation and associated characterization work is under way. An update will be given at the upcoming meeting in Porto and the next steps will be discussed. Background: In 2013 MoniQA initiated a Task Force on the development of food allergen and gluten-free reference materials. The Task Force is an international group comprised of several SDOs (Standardisation Organisations), industry representatives, policy makers, test kit providers and method developers, analytical companies, as well as representatives from various universities. This international group works towards consensus on the specific requirements and the design of global food allergen reference/testing materials and gluten-free standard materials. For this purpose MoniQA has liaised with the EU funded project iFAAM, the Prolamin Working Group (PWG) and Australia's Vital concept group. The aim of MoniQA's initiative is the publication of a Guidance Document on the special requirements and production of food allergen and gluten-free reference materials. Accompanying research and the optimization of the production scheme to provide basic and incurred reference materials, spiked samples and extracts have been initiated. 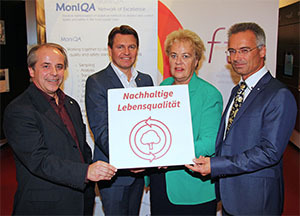 MoniQA and its newly elected officials are looking forward to working with you and assisting you in matters of food safety and quality assessment, research project proposals, workshop and conference organisation, design and production of reference materials, and other international network activities. This year, the C&E Spring Meeting will take place in Budapest with the theme Celebrating Cereals in the AACC International Centennial year: it will be the occasion to review the importance of cereals - and wheat in particular - in our daily diet and discuss the scientific progress in breeding, processing and nutritional aspects, with an outlook to the future. The University of Budapest has a long standing reputation in cereal science thanks to its 95 year old Department of Applied Biotechnology and Food Science at Budapest University of Technology and Economics. In cooperation with the Cereals & Europe team and other organizing and sponsoring parties, the local hosts will do everything to guarantee the friendly environment to our guests for the effective scientific work and networking. Hungary has a long tradition and widely applied results in the areas of cereal breeding, chemistry and technology, qualification agricultural production and milling processes. Therefore it is our great pleasure that Budapest can host the European centennial event of AACCI. The beautiful capital of Hungary with the Danube, many historical places and cultural events ensure the pleasant background of the conference. MoniQA will be represented by Dr. Roland Poms with a talk on the "MoniQA Allergen Reference Materials Programme for Gluten Free Analysis" and "A novel approach of isotope analysis to distinguish organically and conventionally grown crops". The C&E Spring Meeting is intended to all cereal scientists, cereal based product developers, lab technicians, application technologists, plant supervisors, academics keen to learn more about practical aspects of scientific findings and all others stakeholders who want to know more about cereal science and bakery technology. Please make sure to register at www.cespringmeeting2015.org and benefit from the extended Early Bird fee until 16 March 2015! The 5th MoniQA International Conference "Food and Health - Risks and Benefits" on "Innovative Technologies for Food Quality and Safety Management" will be held in Porto, 16-18 September 2015. It continues the successful series of MoniQA International Conferences, and targets participants from regulatory, industry, research and technology, method providers, media and consumer associations. For details please go to the conference website porto2015.moniqa.org. Abstract submission is now open! Please go to porto2015.moniqa.org/abstract_submission for submission guidelines. The submission deadline is 31 May 2015 for oral and poster presentations. Become a sponsor of this event! Find a sponsor package that may be suited for you at porto2015.moniqa.org/sponsoring. This multidisciplinary congress provides a forum for both internationally established and young researchers to exchange advanced knowledge on Food Contaminants and Human Health. The congress will include keynote lectures given by world-renowned scholars, in addition to oral and poster sessions. State of the Art developments in different fields of chemical mixtures: analytical, exposure assessment, bioavailability and toxicity of food contaminants will be covered during presentations. The ICFC2015 has been organized in the context of the project MYCOMIX - Exploring the toxic effects of mixtures of mycotoxins in infant food and potential health impact, funded by the Foundation for Science and Technology (PTDC/DTP-FT0/0417/2012; FCT, Portugal). ICFC 2015 welcomes the submission of abstracts for original contributors to the field of food contaminants and human health. The online abstract submission is now open to all experts and value contributors. You can submit your abstracts directly through the web form available at www.icfc2015.com. The detailed Program is available at www.icfc2015.com/program.htm. The organizers are looking forward to welcoming you in Lisbon! The 2015 MoniQA Board Election is upon us and we ask you to consider the candidates and other association issues and vote. Voting is perhaps one of the most important and significant member privileges. Voting has opened on 29 January 2015 and closed on 16 February 2015. If you are a General Assembly member entitled to vote, please cast your vote at www.moniqa.org/ga/elections_jan_2015 (login required). Thank you for your involvement in the MoniQA Association. Your input and feedback are important to us. We are looking forward to our future collaboration in MoniQA. Roland Poms from ICC/MoniQA and Michele Suman from Barilla are proud to present the Special Issue of the World Mycotoxin Journal (Volume 7, Number 4) on Rapid Methods for Mycotoxin Detection. The issue contains 8 review articles, 2 research articles, as well as a foreword by Michele Suman and Roland Poms, the guest editors of this special edition. The articles contain a clear overview of the latest developments, products, and concerns on use of these fast and easy detection methods. Two of the papers are available as open access: the foreword and the review paper by C. von Holst and J. Stroka on “Performance criteria for rapid screening methods to detect mycotoxins”. If your institute has taken a subscription, all papers are freely accessible on the World Mycotoxin Journal MetaPress web page https://www.wageningenacademic.com/toc/wmj/7/4. As MoniQA member you are eligible for a discounted subscription. On behalf of EuroFIR AISBL we are pleased to announce a workshop on EU Project Management and Science Communication. The workshop will take place at the Thon Hotel Bristol Stephanie in Brussels (Belgium) from Monday 17 November (12:30) to Thursday 21 November 2014 (17:30). Participants will gain sufficient knowledge to successfully manage EU-funded projects. The workshop is targeted primarily at academics or other staff from public, private and non-profit sectors from both EU and non-EU countries new to project management or who want to refresh their knowledge with the advent of Horizon2020. A maximum of 25 applicants will be selected in order to ensure the course is highly interactive. Applicant should have at least a Bachelor of Art or Science at Honours level (BA Hons or BSc Hons) or equivalent and some relevant work experience, e.g. participated in an EU-funded or other multi-centre project. The modules will be taught in English and are highly interactive. Therefore, participants should have a good to very good command of English. View the programme at www.eurofir.org/?p=3330. More information on application, fees and accommodation is available on the EuroFIR website at www.eurofir.org/?p=3315. MoniQA Members are entitled to a 15% discount. It is our pleasure to invite you to participate in the 2014 multi-mycotoxin proficiency test (PT) organised by the MoniQA member CODA-CERVA (Veterinary and Agrochemical Research Centre, Belgium). The main objective of the PT is to provide interested laboratories with an opportunity to test their multi-mycotoxin methods and to compare their results with those of other laboratories. The use of LC-MS/MS methods, although not strictly required, is highly recommended. Detailed information can be found in the attached Invitation Letter. If you wish to participate please register at neonet.coda-cerva.be/neonet/Register_PT.aspx by 14 September 2014. Do not hesitate to contact us for any further information at PT_myco_org [at] coda-cerva [dot] be. The next MoniQA Food Allergen Reference Materials Meeting will be held on Sunday 7 September 2014, 14:00-16:30 prior to the AOAC 128th Annual Meeting and Exposition, in Boca Raton (Florida). Make food information exciting while protecting brands and clients is what thought leaders of the food sector are currently discussing. How to take advantage of the new EU-regulation 1169/2011 on the provision of food information also for non-prepacked foods, which is impacting the entire food supply-chain including eCommerce/food delivery services and catering, restaurants and fresh counters in retail. Join an inspirational day of open innovation to accelerate your food labeling strategy and reduce risks of non-compliance with the help of all experts at your finger tips. For each question, teams will define goals, what has been done and what are the next steps. The MoniQA member ISPA (Institute of Sciences of Food Production, National Research Council of Italy) is organising a Training Course on Detection Techniques for Mycotoxins in the Food/Feed Chain from 6 to 10 October 2014 at ISPA in Bari, Italy, under the aegis of the International Society for Mycotoxicology (ISM). The QAS volume 6, issue 3 (September 2014) is now available and features a special issue on "Food Chemistry and Safety". Edited by Hamit Köksel and Vural Gökmen, both from Hacettepe University, Ankara, Turkey, the presented research papers were selected from invited presentations in association with the EuroFoodChem XVII conference, which took place 7-10 May 2013 in Istanbul, Turkey. The included papers encompass the latest research trends and findings on the emerging topics of food chemistry and safety. The 10 papers included in this special issue were selected from the papers recommended through an external peer-review process. The papers in this special issue describe the recent advancements on analytical methodologies for the determination of nanomaterials in complex samples, safety assessment of engineered metallic nanoparticles in foods, performance of multiplex dipstick immunoassay for screening mycotoxins in cereals, analytical challenges in food chemistry proficiency tests, application of e-nose technique for food quality control using novel oligopeptides based materials, and evaluation of safety risks in thermal processing of foods considering processing contaminants such as acrylamide. In addition, some papers describe also the production and characterization of resistant starch and its utilization as food ingredient, thermolysis products of potato starch as potential prebiotics, and anovel cereal fiber drink as a tool for prevention of civilisation disease. We are pleased to present this special issue to the readers of Quality Assurance and Safety of Crops & Foods journal and food chemistry community worldwide, and hope that it accomplishes our goal of highlighting outstanding recent advances in the field of food chemistry. At the same time we can be looking forward to the next EuroFoodChem XVIII conference in Madrid, Spain, 13-16 October 2015. Vienna, 12 May 2014. An EU-funded research project is shining a spotlight on the benefits, risks and quality of botanicals. Some 30 international research groups worked in a multi-disciplinary consortium to investigate whether botanicals available as drops, capsules, lozenges, tablets and pills, for example, truly deliver on what they promise. The PlantLIBRA research project started in 2010 and ends in May this year. Some 110 experts from over 30 countries participate in the wrap-up event in Vienna, 12-14 May 2014 (plantlibra2014.icc.or.at). The event is managed by ICC, which is also a consortium partner in this EU funded project (www.icc.or.at/projects/plantlibra). The 25 nations involved in the "PlantLIBRA" research project all pursued the same goal: to record the benefits and risks of botanicals and test the quality of the products available on the market. The experts involved also compiled a database that will make it easier for the European Food Safety Authority (EFSA) and other national authorities to assess botanicals. Botanicals, available as capsules, lozenges, tablets, pills and other similar dosage forms, are legally defined as foodstuffs and therefore subject to less stringent regulations than pharmaceuticals. Whether they offer any benefits, or may even pose risks, to consumers is the subject of the EU project that investigated a range of selected samples. "Whether a product actually contains the plant advertised on the package has not been tested in many cases. And it often takes a liability suit before we find out whether the active ingredients in a botanical product are effective or perhaps even poisonous" reports work package leader and Professor Emeritus at the Vetmeduni Vienna, Chlodwig Franz. The goal of this EU project was to shed light on this grey area. Various methods were developed and tested to anaylse the quality and safety of botanicals that are used in food supplements, including DNA analysis techniques that allow the exact identification of the plants used. The researchers examined different products from all over Europe that contained passion flower, devil's claw, melissa, chamomile, valerian, calendula and ribwort. According to researcher Silvia Sponza: "All the European products we examined, including teas, pills, drops, powders and ointments, did in fact contain what was listed on the packaging. And the quality of the active ingredients was even on par with the quality standards that apply to pharmaceuticals." The scientists also drew up a list of analytical laboratories in Europe, an important resource for the industry. This will make it much easier for botanicals manufacturers to select a competent lab to run analyses on their products. The PlantLIBRA final conference is held in Vienna from 12-14 May 2014. Study research partners and representatives from the industry are in attendance. Various experts, including the Coordinator, Professor Patrizia Restani from the University of Milan (Italy), are available during the event at the Hotel Stefanie (Taborstraße 12, 1020 Vienna) for interviews. Please view the full programme at plantlibra2014.icc.or.at/programme and please feel free to contact us for an appointment at office [at] icc [dot] or [dot] at. MoniQA invites to participate in a multi-mycotoxin proficiency test (PT) - free of charge! On behalf of the MoniQA member CNR-ISPA (National Research Council of Italy, Institute of Sciences of Food Production), it is our pleasure to invite interested laboratories to participate in a multi-mycotoxin proficiency test (PT). The main objective of the PT is to provide interested laboratories with an opportunity to test their multi-mycotoxin methods and to compare their results with those of other laboratories. The use of LC-MS(MS) methods, although not strictly required, is highly recommended. Detailed information can be found in the attached Invitation Letter. If you wish to participate please complete the attached Registration Form and send it by email to Veronica Lattanzio (veronica [dot] lattanzio [at] ispa [dot] cnr [dot] it) and Annalisa De Girolamo (annalisa [dot] degirolamo [at] ispa [dot] cnr [dot] it) by 20 May 2014. Do not hesitate to contact us for any further information about the procedure of the proficiency test. GCHERA World Agriculture Prize 2014 - call for nominations now open! Report from the Joint MoniQA/IAM Workshop for Codex Alimentarius (CCMAS) "Sampling Uncertainty"
Over 70 participants attended the annual Joint MoniQA/IAM Workshop for Codex Alimentarius which was held 2 March 2014 in Budapest, Hungary. Chaired by Richard Cantrill, AOCS and Roland Poms, ICC, this year's event focused on "Sampling issues in the light of new approaches and existing Codex Standards". The featured presentations from Roger Wood, Chairman of the Inter-Agency Meeting; Árpád Ambrus, Hungarian Food Safety Office; Steve Ellison, LGC; Astrid Nordbotten, Norwegian Food Safety Authority and Roger Kissling, Fonterra Ltd. were made available to MoniQA members and participants. MoniQA is now collecting ideas and needs for the next Joint IAM/MoniQA Workshop linked to the Codex Alimentarius CCMAS meeting in Budapest in 2015, please send your comments and ideas to moniqa [at] moniqa [dot] org. To join MoniQA, please go to www.moniqa.org. The 3rd International ISEKI_Food Conference will take place in Athens, Greece, 21-23 May 2014 with the general aims to contribute to the creation of an "open" international forum for researchers, education scientists, technologists and industry representatives as well as food consumers, to promote constructive dialogue and collaboration on topics relevant to Food Science and Technology, Industry and Education and to present and disseminate the results of the activities developed by the ISEKI_Food network projects. This conference will be focused on Food Science and Technology for a Bioeconomy 2020. Among a wide number of conference topics, the re-thinking of education in terms of strategies and methods for higher education and continual professional development, the most recent research innovations and emergent requirements, and developments and needs for an industry sustainable food supply, will be on top of the agenda. Several pre-conference events are also included and organized: The final session of the pilot "Summer School" for teachers in Food Science & Technology, and two workshops on European PhD research and involvement and role of industry. For more information including the updated programme, please visit the conference website www.isekiconferences.com/athens2014. We look forward to welcoming you to Athens in 2014. All MoniQA Members are cordially invited to attend the next MoniQA General Assembly scheduled on 2 April 2014, 13:00-15:00, Noordwijkerhout, the Netherlands at the end of the 9th Rapid Methods Europe Conference www.bastiaanse-communication.com/rme2014. A detailed agenda will be provided by beginning of March 2014. Eligible to vote is one representative of each of the institutions registered as MoniQA ordinary and founder member, respectively, whereas a founder member's vote is weighted as three and an ordinary member's vote as one vote. If the main contact of an institution is unable to attend the General Assembly, a replacement from the same institution can be nominated, which needs to be communicated to us prior to the meeting. Rapid Methods Europe - RME2014 (www.bastiaanse-communication.com/rme2014) takes place in Noordwijkerhout, the Netherlands, 31 March - 2 April 2014. RME2014 is the 9th in a series of conferences dedicated to innovations and breakthroughs in microbiological and chemical analysis of food, feed and water. This series aims to further strengthen the academia-industry relations and to further disseminate advanced research towards practical applications in food, feed and water analysis. MoniQA organised a technical session at the conference on 2 April 2014 and will also hold its annual General Assembly at the end of the conference 13:00-15:00 on 2 April 2014. For details please consult the conference programme at www.bastiaanse-communication.com/rme2014/cp.pdf. ... for microorganisms (indicator and spoilage microorganisms, pathogens), contaminants (due to contamination, cultivation practices or production processes), allergens, GMOs and veterinary drug residues, as well as for authenticity/adulteration and forensic identification. As a comprehensive overview RME2014 offers an excellent way to network and to share ideas, providing a reference source for anyone wishing to gain insight into the latest developments in microbial and chemical analysis of food, feed and water ensuring safety and quality. Roland Poms, Secretary General of ICC and MoniQA Association will lecture on "Reference Materials and Method Validation in Food Safety Assurance" at BOKU - University of Life Sciences and Natural Resources, Vienna, Austria. Apart from enrolled MSc and PhD students, ICC and MoniQA members have access to a maximum of 10 places. If interested, please register by email to office [at] icc [dot] or [dot] at. The lectures, excursions and workshop activities are on 5 afternoons. Invited speakers from international standardisation organisations will enrich the workshop programme and give a global perspective and the value of international standards. The aim of the workshop on "Reference materials and method validation in food safety assurance" is to describe the issues and challenges involved in the international comparability and validity of analytical results in the assurance of food safety and quality. On the basis of practical examples the focus will be on current hot topics, such as mycotoxins, food allergens, pathogenic micro-organisms, GMOs, etc., the analytical possibilities (including rapid methods), and the corresponding EU regulations. Additionally, an overview of international standardization bodies and examples of international validation studies will be given. More than 600 people from 48 different countries attended the Horizon 2020 info day calls for proposals for Societal Challenge 2 (SC2) and LEIT- Biotechnology. This major event took place in Brussels, on 17 January 2014, at the Charlemagne building and was organised by the European Commission's Directorate General for Research and Innovation through Directorate F – Bioeconomy. You can access the presentations given on the day at ec.europa.eu/research/bioeconomy/news-events/news/20140117_03_en.htm, which will be updated regularly. Roland Poms, Secretary General of ICC and MoniQA, attended the Info Day in Brussels on behalf of members of ICC and MoniQA. Several specific questions communicated by members in advance of the meeting to the Secretariat of ICC and MoniQA could be addressed in the afternoon discussions with the EC officials. Members only can see some more detailed information and possibilities of joint collaborative projects in the protected members area at www.icc.or.at for ICC and www.moniqa.org for MoniQA (for members visible after log in). ICC and MoniQA will continue to disseminate up-to-date information on new developments within Horizon 2020 and will facilitate project participation for its members. Roland Poms, Secretary General of MoniQA Association, will attend the Info Day on 2014 Horizon 2020 calls for proposals - Societal Challenge 2 and LEIT Biotechnology (ec.europa.eu/research/bioeconomy/news-events/news/20140117_en.htm). After MoniQA's successful completion of its Network of Excellence in 2012 and its foundation as legal entity in 2011, MoniQA has been directly or indirectly involved in various project proposals. The most recent success was partnering in iFAAM (2013-2017). With the available expertise and experience with attracting EU funding for collaborative research projects and involvement in EU’s Framework Programmes (FP4-FP7) as Coordinator (ECC 2002, MoniQA), as Workpackage Leader or Partner (HEALTHGRAIN, ISEKI, CommNET, PlantLibra, Connect4Action, iFAAM, MyNewGut, MycoSpec, EMPORA) or as Member of the Advisory Board (MycoRed, DREAM, TradeIT), at the MoniQA Secretariat (c/o ICC Headquarters, Vienna, Austria), MoniQA will again facilitate and/or partner in collaborative project proposals with Horizon 2020. As a special service for MoniQA Members, Roland Poms and the MoniQA Secretariat in Vienna will support members’ initiatives and provide advice in partner search or direct requests to programme officers. Horizon 2020 is the biggest EU Research and Innovation programme ever with nearly € 80 billion of funding available over 7 years (2014 to 2020) - in addition to the private investment that this money will attract. It promises more breakthroughs, discoveries and world-firsts by taking great ideas from the lab to the market. For more information please contact the official website at ec.europa.eu/programmes/horizon2020. MoniQA will be happy to discuss your ideas and proposals. Members of MoniQA enjoy additional privileged information and services useful for project proposals and collaborations. If you are not a member of MoniQA yet, please refer to www.moniqa.org/news/renew_moniqa_membership and choose your preferred involvement in MoniQA. Thank you for your collaboration with MoniQA in 2013. MoniQA wishes you a successful 2014! On behalf of MoniQA Association I would like to thank you for your trust and collaboration in the past year. We can look back to another successful year in MoniQA, thanks to the great collaboration of the global MoniQA network of members and stakeholders. We are looking forward to providing ever improving services to the food safety community worldwide. We hope for your continuous trust and we would like to wish you a Happy Holiday Season and a Successful New Year. Please mind that the MoniQA Secretariat, hosted by ICC Headquarters, will be closed between Christmas and New Year (23 December 2013 - 1 January 2014). ICC and MoniQA will support the TRADEIT project by disseminating project results and inviting bakeries to participate at training events offered by the project free-of-charge in various locations and in local languages all around Europe. TRADEIT is funded under FP7 KBBE.2013.2.3-02 Grant Agreement No KBBE-613776. It is accepted that resource limitation precludes majority of Traditional Food Producing SMEs from participating in innovative and entrepreneurial activities. The TRADEIT project aims to address this through an ambitious program of events and supports for the Traditional Agri-Food sector which will through the promotion and facilitation of Collaboration, Innovation, Entrepreneurship, Knowledge and Technology Transfer will increase the competitiveness and inter-regional advantage of participating Traditional Food Producing SMEs. Acknowledging that time requirements and language barriers frequently disincentives SME participation in training and dissemination events TRADEIT will establish and pilot 9 TRADEIT Hubs in a total of 8 partner countries: Ireland, UK, Spain (2 Hubs), Portugal, Italy, Germany, Poland and Finland. Each Hub will form a sub-network, defined by regional and language with an associated network of local and regional traditional food producers and linked to the relevant National Technology Platform, Food for Life and other national food and drink and policy organisations. A TRADEIT Advisor is allocated to each Hub to co-ordinate regional events and act as an SME liaison. Germany will be the Hub Leader (ILU e.V.) for the Bakery Sector. For supporting participating SMEs, the Hub Events will be free-of-charge, to a specific limit in terms of travel to/from the event venue and accommodation. SMEs will be selected together with the Hub Sub-network Partners. For further information and to contact the Hub Coordinator, please go to www.ilu-ev.eu/latest-infos/tradeit.html. Following on from the successful series of Workshops held immediately prior to the recent Sessions of CCMAS the IAM/MoniQA Workshop organisers were asked by delegates to further develop a number of issues of concern. In particular they were asked to consider whether it would be appropriate to develop a Workshop to discuss Sampling issues in the light of new approaches and exisitng Codex Standards. This has become particularly important given the increasing awareness of sampling uncertainty and at the same time confusion about its assessment and procedures to take appropriate and representative samples in diffferent commercial and regulatory environments. Starting as an exlusive offer for delegates of Codex Alimentarius these workshops have also become part of Continuous Professional Development for policy makers and decision makers in food businesses. Please find a draft programme at www.moniqa.org/events/workshop_budapest_march_2014. The workshop is organised jointly by IAM and MoniQA. It will be held at the Ramada Plaza Budapest Hotel, now with a new name: The Aquincum Hotel Budapest, Árpád fejedelem útja 94, Budapest 1036, Hungary (www.aquincumhotel.com). This workshop is free for CCMAS delegates and members of IAM, discounts apply for MoniQA members and students. Registration is required by all participants and speakers. Please register online at www.moniqa.org/events/workshop_budapest_march_2014/register. Please mind that only a limited number of places are available and that registrations will be considered on a first-come-first-serve basis. We are looking forward to seeing you in Budapest in 2014! The training is organised by the University of Food Technologies and the MoniQA Association. Participants will learn about the common food pathogens and the available rapid methods for microbiological analysis of foods. The FST (food scientist training) will provide relevant theoretical knowledge and hands-on experience on PCR methods (classical PCR and real-time PCR) for the detection and quantification of pathogens in food samples.This year the training will expand its focus to mycotoxins in foods – producing microorganisms and factors contributing to mycotoxin contaminations, methods for de-toxification and the regulatory frame. It is time again to renew your MoniQA Association Membership for another year and benefit from MoniQA's international network and a variety of activities and services (details can be found on www.moniqa.org/about/association). Easy access and involvement in international research proposals and projects funded by the EU, UNO, Bill Gates Foundation, governments, etc. Preparation and exploring research proposals for EU's Horizon2020 Funding Programme. Examples of past and current project involvement of MoniQA are MoniQA NoE (FP6), PlantLibra (FP7), Connect4Action (FP7), iFAAM (FP7), and others. Preparation of guidelines and protocols for validation of screening methods, validation of binary methods, validation of mass spectroscopic methods, current focus on mycotoxins, allergens, and authenticity issues. 25-29 November 2013, Vienna, Austria: BOKU lecture and MoniQA Training Course, "Reference Materials and Method Validation in Food Safety Assurance"
11-12 December 2013, Bangkok, Thailand: MoniQA Workshop "Effective Mycotoxin Management" – Sponsoring and contribution opportunity for MoniQA Members! 17-18 December 2013, Bangkok, Thailand: MoniQA Workshop "Effective Food Allergen Management"
4 March 2014, Budapest, Hungary: MoniQA/IAM workshop for Codex Alimentarius on "Sampling Uncertainty"
If you want to make use of any of the sponsoring or contribution opportunities at the meetings mentioned above, please contact Roland Poms at roland [dot] poms [at] icc [dot] or [dot] at. If you have any questions related to your membership status, please contact Sabine Gratzer (sabine [dot] gratzer [at] icc [dot] or [dot] at). "Allergen-free Food: Market Opportunity and Process Control Plans for Food Manufacturer" taking place at the Bangkok Cha-da Hotel, Bangkok, Thailand from 17-18 December 2013. Allergen-free food market is a global rapid-growing segment. The largest share of allergen-free food product value sales comes from North America and Europe. Analysts estimated annual growth rate of allergen-free food market in the US. being more than 10% and product sales in the year 2018 being more than US$ 6.2 billion. The fast growing market of allergen-free food is due to not only an increase in numbers of food allergy individuals but also allergen-free food has been considered to be healthy food. Foods identified as allergens are wheat, milk, egg, peanut, soybean, fish, seafood, sesame and tree nuts. These foods are common ingredients in many food products. To produce allergen-free food products, food manufacturers have to be aware of types of allergens, control plan for processing, cross contamination possibly occurring during processing, detection methods for allergens and regulations including allergen-free labeling. For more details including the programme and registration form please go to www.moniqa.org/events/workshop_allergen_bangkok_2013. MoniQA, the National Center for Genetic Engineering and Biotechnology (BIOTEC), the National Science and Technology Development Agency (NSTDA) and the Ministry of Science and Technology would like to invite you to attend the Workshop "Effective Mycotoxin Management" taking place at the Thailand Science Park, Tha Khlong, Pathum Thani / Bangkok, Thailand on 11-12 December 2013.
and to get insight in mycotoxin risk analysis and mitigation strategies to control contaminations. The rationale of this workshop: The worldwide contamination of foods and feeds with mycotoxins poses a significant problem to staple foods and meat production. Mycotoxins are secondary metabolites of molds that have adverse effects on humans, animals, and crops that result in illnesses and economic losses. The accumulation of mycotoxins in foods and feeds represents a major threat to human and animal health as they are responsible for many different toxicities including the induction of cancer, mutagenicity and estrogenic gastrointestinal, urogenital, vascular, kidney and nervous disorders. Some mycotoxins are also immuno-compromising, and can thus reduce resistance to infectious disease. Significant economic losses are associated with their impact on human health, animal productivity, and both domestic and international trade. This workshop aims to provide knowledge and expertise in the mycotoxin field from both Thailand and abroad. Invited are quality managers, food manufacturing auditors, food scientists, toxicologists, representatives and decision makers from industry, policy and academia. For more details including the programme and registration form please go to www.moniqa.org/events/workshop_mycotoxin_thailand_science_park_2013. The 2nd iFAAM (Integrated Approaches to Food Allergen and Allergy Risk Management) consortium meeting will be held 7-9 October 2013 in Cork, Ireland. Roland Poms will represent ICC and MoniQA. For more information on this event please see here. For further information on the project please click here. The second meeting was held in Vienna at the ICC Headquarters, 13 June 2013, chaired by Dr Roland Poms, ICC and MoniQA Secretary General. This meeting was held in connection with the GF13 - the 3rd International Symposium on Gluten-Free Cereal Products and Beverages. The next MoniQA Food Allergen Reference Materials Meeting (by invitation only) will be held on 10 October 2013 prior to the 27th Meeting of the Working Group on Prolamin Analysis and Toxicity in Darmstadt, Germany, 10 - 12 October 2013. Please find details of the Prolamin WG meeting at www.moniqa.org/events/prolamin_wg_meeting_oct_2013. Two new MoniQA workshop videos available: "Method Performance" and "Analytical Uncertainty"
The videos of the MoniQA workshop "Method Performance and Analytical Uncertainty", 19 June 2013, BOKU, Vienna, Austria, held by Richard Cantrill (AOCS) on Method Performance and Hilde Skår Norli (NMKL) on Analytical Uncertainty are now available on the MoniQA website. They can be watched for free for MoniQA members (please log into the MoniQA website) and will be available via paid access for non-members soon.